Can You Match the Coins? - NEW! This money worksheet generator teaches children to recognize US coins. Select heads or tails for each column; also select ascending, descending, or randomized order of the US (United States) coins to create a worksheet. See example sheet on the right or view a sample page. Can You Match the Coin's Name? - NEW! This money worksheet generator teaches children each coin name. 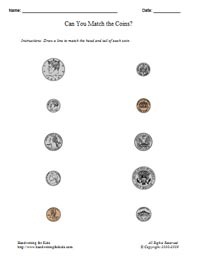 Select heads or tails only, or a randomized selection of heads and tails; also select ascending, descending, or randomized order of the US (United States) coins to create a worksheet. See example sheet on the right, or view a sample page. Can You Write the Coin's Name? - NEW! 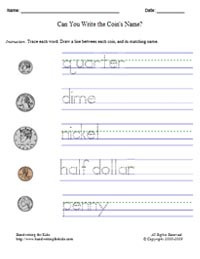 This worksheet teaches children coin recognition and corresponding coin's name. A great way for kids to learn to write and extend their vocabulary with new sight words. 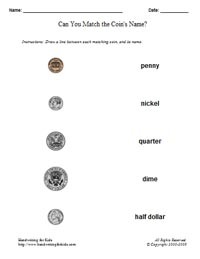 This worksheet covers the following coin's name: penny, nickel, dime, quarter, half dollar. See example sheet on the right or view a sample page. Can You Match the Coin's Amount? - NEW! 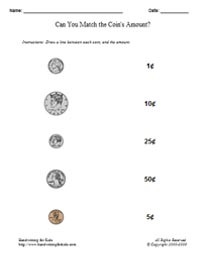 This money worksheet generator will help children learn the amount of each coin. Select heads, or tails only, or a randomized selection of heads and tails; also select ascending, descending, or randomized order of the US (United States) coins and amounts to create a worksheet. See example sheet on the right or view a sample page. What is the total amount? - Pennies - NEW! 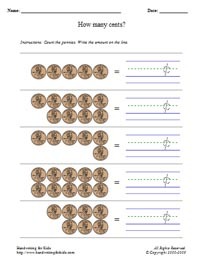 This money penny math worksheet generator is one of many interactive pages. This page is designed primarily for K - 2. Children will learn how to add / count pennies (1¢). Drop down menu options are heads only, tails only, randomized selection of heads and tails in ascending, descending, or randomized order. See example sheet below or view a sample page. What is the total amount? - Nickels - NEW! 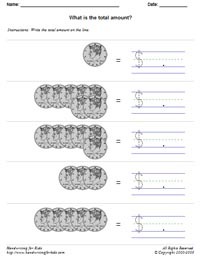 This money nickel math worksheet generator is one of many interactive pages. This page is designed primarily for K - 2. Children will learn how to add / count nickels (5¢). What is the total amount? - Dimes - NEW! 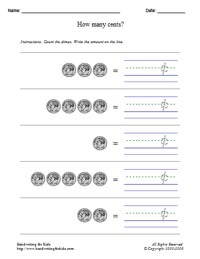 This money dime math worksheet generator is one of many interactive pages. This page is designed primarily for K - 2. Children will learn how to add / count dimes (10¢). What is the total amount? - Quarters - REVISED! 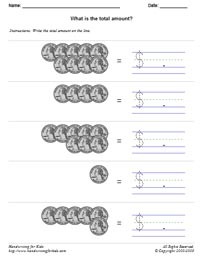 This money quarter math worksheet generator is one of many interactive pages. This page is designed primarily for K - 2. Children will learn how to add / count quarters (25¢). What is the total amount? - Half Dollars - REVISED! 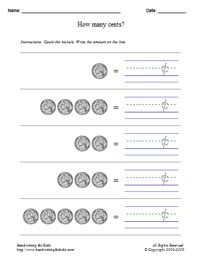 This money half dollar math worksheet generator is one of many interactive pages. This page is designed primarily for K - 2. Children will learn how to add / count half dollars (50¢). Penny Math 01 - Match the amount. Check out some of our other pages: Money Coloring Book, Money Journals. 3. Select tails, and print.